It's great to see that the forum's momentum is speeding up... during the past three days... (edit:) 11 new members have joined! And it's great to see that more members have started participating in the discussions (almost a 100 of the 170+ members have done that so far). GLOBAL HANDS QUIZ: 'A journey around the world'! But don't worry, it will not be as hard as the 2nd quiz (the 'weird handlines quiz'... nobody solved that one yet!). Re: Forum 'momentum' speeding up...? One flower ... for each single new member today!! Welcome to all recent members. Nice to see some old faces again, eg shayn & Liliana from the old handreading cybercafe, stalin from PI forums.... and premlara - could that be my old friend prem who has the music channel? (premlara - my apologies if I got the wrong person!). Look forward to reading all new members' intros & contributions! 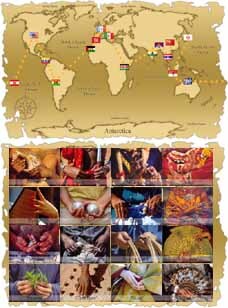 This weekend you will be able to participate in a brand new 'hands-adventure': concerning... a 'journey around the world' - featured with a meeting with 16 remarkable hands from sixteen countries!! Each destination relates to one of the 16 hands involved; and you will be able to discover the homelands of each hand... in the format of a new QUIZ! ... Get ready to participate! !